Place: Coconut Grove. 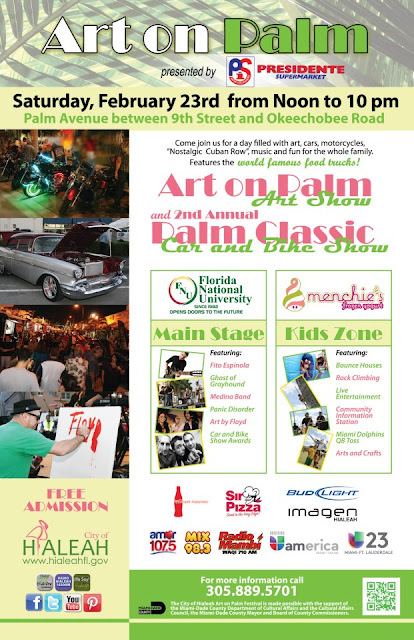 As per the official site info: "Nearly one mile of arts, food and fun, the Festival is held annually in the streets of Coconut Grove, Florida – a charming village within the city of Miami. The Festival is located just south of downtown Miami, adjacent to beautiful Biscayne Bay. It runs along the streets of McFarlane Road, South Bayshore Drive and Pan American Drive." We will be meeting on site. Attire: No club shirts. Just casual wear. General Info: The Coconut Grove Arts Festival is just that: an arts festival. No car involvement. Very laid back. It's all about the arts, crafts, food, music, and lots of interesting characters. If you have never gone, you should experience it at least once in a lifetime. We try to go very year. Admission fee per person is $10.00. Free admission for children under 12. General Info: If you've ever wanted to feel like a celebrity for an evening and show off your hot ride in the process, then this event is one you won't want to miss. Your car will be a star for the evening. Pictures will be taken of your car looking glamorous and posted on the official Gus Machado Facebook Page, and there will be music and free food (and seriously, who doesn't love that?). This is an open invitation but spots are limited so please contact us by Wednesday February 20th at the latest to reserve your spot - subject line: "Gus Machado Ford Event." Place: 501 Palm Avenue, Hialeah. Please note: We will be meeting off of I-75. Leaving promptly at 2 pm from the Sedanos Parking Lot located on 186 st and NW 87 Ave.
General Info: Live bands, DJ, Arts and Crafts show. Entertainment all day. Food trucks.